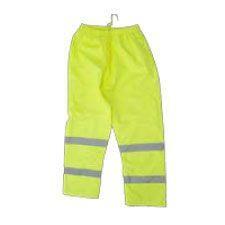 High Visibility Rain Pants. 100% Waterproof, 2,000 mm breath-ability, ANSI 107-2010, Class 3 certified. Fake fly / hook & loop closure. Two front side pockets and 12" leg opening. High Visibility Lime Color.